Scientific data is a useful thing and you too can be scientists and data collectors! An integral part of the Brooklin Lions Wilderness Trail is not only the completion of the trail itself, but the long term monitoring of the ecological health of the East Lynde valley. In regards to humans, trail management will ensure that human impact is kept to a minimum. Studies and surveys will be periodically conducted of the vegetation and wildlife, including birds, mammals, reptiles, amphibians, fish, and insects. 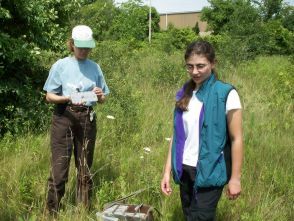 Students from the ecosystem management program of Sir Sandford Fleming College have begun monitoring the water quality. Are you interested in helping and learning more about nature? Frog Watch, a program organized by Adopt-a-Pond of the Toronto Zoo, will allow you to listen and report frog and toad calls. Your local naturalists clubs are excellent groups that can involve you in bird and butterfly counts. Contact the Federation of Ontario Naturalists, or more locally, the Durham Field Naturalists and the Pickering Field Naturalists. You can help out with Frog Watch too! Ask your parents for their help. Take a picture of your family in the same spot every season or every year. After a few years, look for changes, not only in your family, but in the natural world revealed by the photograph. If you are keen, use a string to create a square metre (1 metre x 1 metre) anywhere beside the trail. Pick a spot you can easily identify year after year. Record or sketch your observations of the types of plants or insects found in your square metre. In a years time return and do the same and note any changes. Remember not to leave the string there! Get a field guide from the library and try to learn how to read animal tracks in the snow. It takes some practise. Keep a list from year to year of the tracks you have identified in the valley.